Though its acquisition by Microsoft is probably a few months away, investors could stand to gain over a 20% return on an annualized basis using this little-discussed investing strategy. When investing in the stock market, there's no such thing as a sure thing. However, LinkedIn's (NYSE:LNKD.DL) soon-to-be-acquired stock appears to offer as close to a "free lunch" as is possible in the stock market today. Let's explore the interesting investing scenario in LinkedIn's stock today, why it exists, and a few additional important considerations when similar merger investing scenarios arise. LinkedIn's stock: A quick profit opportunity? 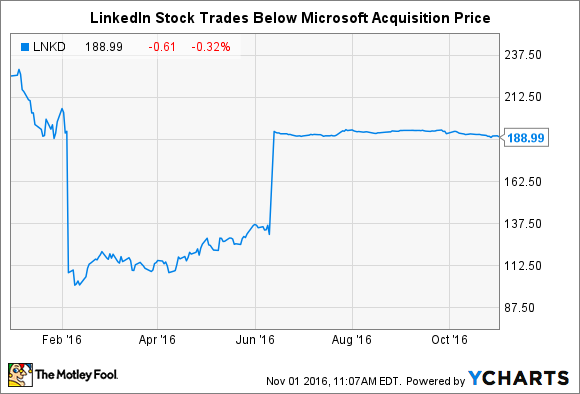 As you probably know, Microsoft (NASDAQ:MSFT) announced its deal to acquire LinkedIn for $26.2 billion, or $196 per share, this June. As is common with most merger situations, LinkedIn's stock rocketed toward the pre-determined acquisition price when the news broke. Importantly though, LinkedIn's stock remains about $7 or $8 lower than the actual buyout price. So why does this gap between stock price and merger price exist? The obvious answer is uncertainty. As the thinking goes, unknown factors could arise and sink the merger, probably resulting in a loss of some or all of the 49.5% premium Microsoft offered as an incentive to close the acquisition. That's certainly the case in most merger scenarios. However, this uncertainty exists for a far lesser degree in the case of LinkedIn and Microsoft. This far along in the process, few major obstacles exist that could sink Microsoft's LinkedIn buyout. LinkedIn shareholders already voted in an overwhelming majority to accept the deal in August, so gaining the necessary approval from investors -- a major potential hurdle -- is no longer a factor. Check yet another significant obstacle off the list. In terms of significant events remaining, it appears gaining regulatory approval remains the lone major factor that could upend the deal, and even this risk seems relatively diminutive this far along in the process. Case in point, regulators in the U.S., Canada, and Brazil have all signed-off on the deal. The lone major regulator that analysts fear could derail the Microsoft-LinkedIn deal is the European Union. The EU's antitrust regulator is currently examining the deal and has set a preliminary deadline to conclude its review by November 22nd, though this date can be extended should the EU opt to further scrutinize its competitive implications. At the heart of the EU's concerns is LinkedIn's massive data set, which rivals like Salesforce.com (NYSE:CRM) are howling could provide Microsoft an outsized advantage in the years to come. For context, large sets of user profile data are especially critical in developing still-emerging technologies like artificial intelligence. Salesforce.com claims allowing Microsoft exclusive access to LinkedIn's data could provide it with an outsized advantage in the development of AI-powered technologies that could eventually yield a major advantage across many applications, particularly the market for CRM software where Salesforce and Microsoft currently compete. However, those in Microsoft's corner are quick to note that outside companies like Salesforce have never had full access to LinkedIn's data set. They also point out that other social media companies, particularly Facebook, also collect massive user data sets that could be tapped as an alternate source for future technological development. Furthermore, EU regulators also similarly examined and ultimately approved other landmark tech deals including Google's purchase of DoubleClick and Facebook's WhatsApp buyout.Especially with other major regulators having already approved the deal, few precedents exist of the EU blocking major mergers on this kind of grounds. So while gaining EU regulatory approval remains a critical risk, it also strikes me as fairly likely to occur, leaving few clearly observable risks to the deal remaining. To be clear, receiving all the necessary approval for the deal to proceed still doesn't make Microsoft's purchase of LinkedIn certain. It just removes one of the largest observable pitfalls from the process. Though the deal seems overwhelmingly likely to close, any number of unforeseen or unexpected events could still scupper the deal. A recession could start for any number of reasons. A Federal Reserve interest rate decision could somehow change market conditions. Microsoft, for some inexplicable reason, could suddenly become unable to borrow the $26.2 billion in debt it plans to use to finance the buyout. Sure, each of these situations seems highly unlikely in the near term. But "unlikely" is a far cry from impossible, and that "certainty gap" between those two situations is what creates the $7-$8 spread between LinkedIn's current stock price and its pre-determined buyout share price. An entire sub-specialization in investing already exists to profit from these exact situations. It's called merger arbitrage, and it's a proven strategy that hedge funds have used to create immense wealth for their billionaire owners. Without delving too deep into the strategy, merger arbitrage involves buying the stocks of to-be-acquired companies to collect that minute gap when the buyout deal closes. This is something of an oversimplification of the strategy -- merger arbitrage often involves hedging out certain risks and adding leverage to magnify returns. The strategy has been demonstrated to be uncorrelated to the broader stock market, and it has been used to create immense profits for its investors. Returning to the case of LinkedIn, the risk-return profile appears quite favorable for a few reasons. Both companies have repeatedly said they expect the deal to close by the end of the year -- so in less than two months. This means an investor purchasing LinkedIn stock today at around $189 stands to make about $7when the merger closes. Assuming the end-of-2016 closing date remains intact, this means investors will realize about a 3.5% return on their investment in less than two months' time, which corresponds to about a 21% return on an annualized basis.